In the paper describing the new giant titanosaur Dreadnoughtus, Lacovara et al. (2014) use the limb bone allometry equation of Campione and Evans (2012) to derive a mass estimate for the holotype individual of 59.3 metric tons. This is presumably the “middle of the road” value spat out by the equation; the 95% confidence interval on either side probably goes from 40 to 80 metric tons or maybe even wider. I decided to see if 59 metric tons was plausible for Dreadnoughtus by doing Graphic Double Integration (GDI) on the published skeletal reconstruction and body outline (Lacovara et al. 2014: fig. 2). The image above is the one I used, so if you like, you can check my numbers or try your hand at GDI and see what you get. First up, I have to congratulate Lacovara et al. for the rare feat of having everything pretty much to scale, and a properly-sized scale bar. This is not always the case. Presumably having a 3D digital model of the reconstructed skeleton helped — and BTW, if you haven’t downloaded the 3D PDFs and played with them, you are missing out bigtime. * I didn’t include the cervical because when I measured it I sorta guessed about where the condyle was supposed to be. That was the odd measurement out, and I didn’t want to tar Lacovara et al. for what might well be my own observer error. Okay, this is looking pretty good, right? Lacovara et al. (2014) got 59.3 metric tons using limb allometry, I got a volume of 57 cubic meters using GDI. If Dreadnoughtus was the same density as water — 1 metric ton per cubic meter — then my estimated mass would be 57 tons, which is crazy close given all of the uncertainties involved. BUT there are a couple of big buts involved. The first is that a lot of sauropods had distinctly non-round body cross-sections (Diplodocus, Camarasaurus). So assuming circular cross-sections might inflate the body well beyond its likely volume. Second is that sauropods were probably much less dense than water (discussed here, here, and here, and see Wedel 2005 for the full scoop). What are the implications for Dreadnoughtus? I don’t remember what the pixel counts were for the max height and max width of the torso, but they were pretty close. I measured at several points, too: front of the pelvis, max extent of ribcage, mid-scap. This is probably not super-surprising as the fatness of titanosaurs has been widely noted before this. 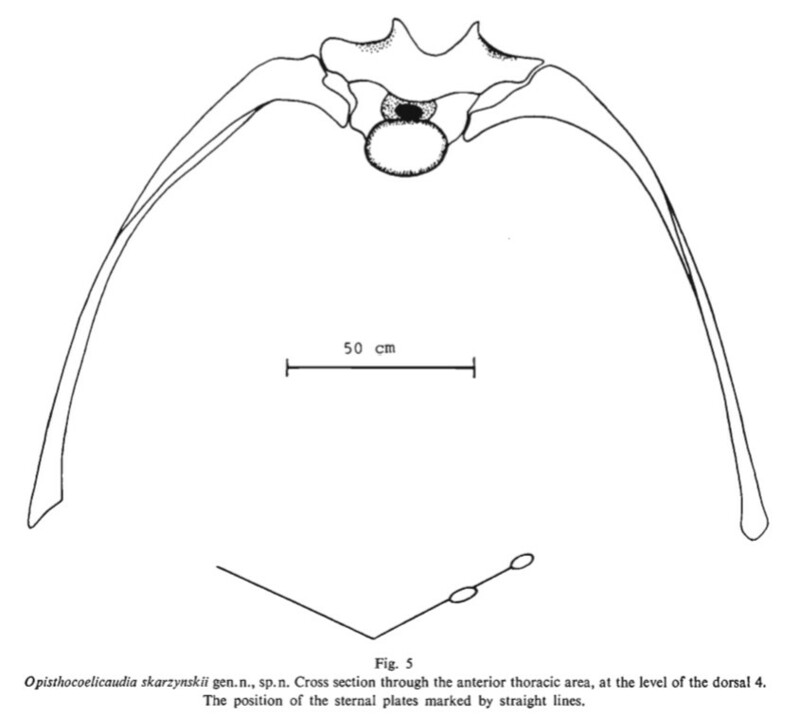 Here’s a cross-section through the torso of Opisthocoelicaudia at D4 (Borsuk-Bialynicka 1977: fig. 5) — compare to the more taconic forms of Diplodocus and Camarasaurus linked above. Okay, a round torso on Dreadnoughtus I can buy. A round neck and tail, not so much. Look at the skeletal recon and you can see that even with a generous allowance for caudofemoralis muscles on the tail, and diapophyses on the cervical vertebrae, no way were those extremities circular in cross-section. Just off the cuff I think a width:height ratio of 2:3 is probably about right. Now, for density. Birds are usually much less dense than water — lotsa cited data in this hummingbird post, the punchline of which is that the average whole-body density of a bunch of birds is 0.73 g/cm^3. Why so light? In part because the lungs and air sacs are huge, and account for 15-20% of the whole-body volume, and in part because many of the bones are pneumatic (= air-filled). For a really visceral look at how much air there can be in the bones of birds, see this post, and this one and this one for sauropods. In my 2005 paper (almost a decade old already — gosh! ), I found that for Diplodocus, even a fairly conservative estimate suggested that air inside the bones accounted for about 10% of the volume of the whole animal in life. That may be higher than in a lot of birds, because sauropods were corn-on-the-cob, not shish-kebabs. And that’s just the air in the bones — we also have several lines of evidence suggesting that sauropods had air-sacs like those of birds (Wedel 2009). If the lungs and air sacs occupied 15% of the volume of the whole animal, and the air in the bones occupied another 10%, that would give a whole-body density pretty close to the 0.73 g/cm^3 found for birds. Sauropods might have been lighter still — I didn’t include visceral, intermuscular, or subcutaneous diverticula in my calculations, because I couldn’t think of any way to constrain their volumes. What about Dreadnoughtus? As Lacovara et al. (2014) describe, the cervical, dorsal, and sacral vertebrae and sacral ribs are honeycombed with pneumatic camellae (small, thin-walled chambers). And the dorsal ribs have pneumatic foramina and were probably at least partly hollowed-out as well. The caudal vertebrae do not appear to have been pneumatic, at least internally (but diverticula going into the tail can be cryptic — see Wedel and Taylor 2013b). Diplodocus has a big, long, highly pneumatic tail, but Dreadnoughtus has a much longer neck, both proportionally and absolutely, and pneumatic dorsal ribs. So this one may be too close to call. But I also ran the numbers for T. rex way back when and found that air in its vertebrae accounted for 7% of its body volume (this abstract). Pessimistically, if we assume Dreadnoughtus had small lungs and air sacs (maybe 10% of whole-body volume) and not much air in the bones (7%), it’s whole-body density was probably still closer to 0.8 g/cm^3 than to 0.9. Optimistically, a lot of titanosaurs were radically pneumatic and they have may have had big air sac systems and extensive diverticula to match, so a bird-like 0.7-0.75 g/cm^3 is certainly not beyond the bounds of possibility. This table shows a spectrum of masses, based on the three body volumes from GDI (columns) and some possible whole-body densities (rows). Note that the columns are not in the same order as in the first table — I lined them up from most t0 least voluminous here. The 57-ton estimate is the max, and that assumes that the neck and tail were both perfectly round, and that despite the lungs, air sacs, and air reservoirs inside the bones, the whole-body density of Dreadnoughtus was still 1.0 g/cm^3, neither of which are likely (or, I guess, that a real Dreadnoughtus was significantly fatter than the one shown, and that all of that extra bulk was muscle or some other heavy tissue). The 28t mass in the lower left corner is also unrealistic, because it assumes a tall, narrow torso. My pick is the 36t estimate at the bottom of the middle column, derived from what I think are the most defensible volume and density. Your thoughts may differ — the comment thread is open. This last table is just a quick-and-dirty comparison of how the volume of the body breaks down among its constituent parts in Plateosaurus (from this post), Giraffatitan (from Taylor 2009), and Dreadnoughtus (based on my “tall neck and tail” GDI). Dreadnoughtus seems to have a more voluminous neck and a less voluminous trunk, proportionally, than Giraffatitan, but I think a lot of that is down to the very fat fleshy envelope drawn around the cervicals of Dreadnoughtus. We are fortunate to count some fearsomely talented paleoartists among our readers — I’ll look forward to seeing what you all come up with in your independent skeletal recons. So, what’s the take-home? Based on the data available, I don’t think the holotype individual of Dreadnoughtus massed anything like 59 metric tons. I think 35-40 metric tons is much more defensible. But I’m happy to have my errors pointed out and new data and arguments brought to the fore. Your thoughts are most welcome. Wedel, M.J. 2005. Postcranial skeletal pneumaticity in sauropods and its implications for mass estimates. pp. 201-228 in Wilson, J. A., and Curry-Rogers, K. (eds. ), The Sauropods: Evolution and Paleobiology. University of California Press, Berkeley. I blindly decided that 45 tons was more realistic for a 26 meter, robustly built titanosaur, and I like how close your 41 ton estimate is. Just wondering, is using the sparseness of flying birds to estimate air space proportion in dinosaurs defensible? I mean, there had to be an extra level of pneumatization needed simply for flight. I would think a sauropod of similar volume to that of a robin would weigh more due to massive leg bones, lots of guts, etc… Any thoughts? Perhaps someone needs to get their hands on an emu or something and check its ASP. :) Sounds like a fun project! Just wondering, is using the sparseness of flying birds to estimate air space proportion in dinosaurs defensible? I mean, there had to be an extra level of pneumatization needed simply for flight. Pneumatization in birds seems to track more with size than with flight ability. A lot of small to medium-sized birds have very limited skeletal pneumaticity. Pat O’Connor found a “common pattern” of postcranial pneumatization in extant birds in which just a few vertebrae at the cervico-dorsal junction are pneumatized. There are lots of exceptions, especially big charismatic fliers like albatrosses and birds of prey, but then you have diving birds like loons with no postcranial pneumaticity at all. I would think a sauropod of similar volume to that of a robin would weigh more due to massive leg bones, lots of guts, etc… Any thoughts? It’s possible. Sauropods do have pretty massive leg bones, with pretty small marrow cavities. But the limb bones are such a small part of the body volume, I don’t think they’d come close to offsetting the density reduction achieved by pneumatizing the vertebrae. I suppose we’re getting to point where someone could test this by building a 3D virtual sauropod with lungs, guts, muscles, bone marrow, and all the rest. Perhaps someone needs to get their hands on an emu or something and check its ASP. :) Sounds like a fun project! All the big ratites are highly pneumatic. And there will be some interesting new information about the skeletal masses of ratites in an upcoming publication (not one of ours). I’ll doubtless blog about that paper when it’s published, and I’ll try to remember to boomerang back to this comment thread when I do. Based on the data available, I don’t think the holotype individual of Dreadnoughtus massed anything like 59 metric tons. I think 35-40 metric tons is much more defensible. What this really tells us is not that either you or Lacovara et al. got this wrong, but that using two different approaches to mass estimation gives results that differ by 57%. And that also needn’t mean that one of the methods is “better” than the other, but that they are telling us different things. Specially, Lacovara et al. tell us that Dreadnoughtus has limbs whose robustness is appropriate for a 59-tonne animal; you tell us that in fact it likely massed less than two thirds of that. So it was probably somewhat more athletic than we would usually expect for an animal of its size. We can deduce this from seeing where the actual mass falls relative to the regression line. But if you get your mass estimate from the regression line, then by definition you can’t make such deductions. That’s why I consider mass estimates from limb-bone allometry less than satisfactory. Obviously for a lot of extinct animals they’re the only estimate we’re ever going to get, and it’s good to have them on that basis; but when we have sufficiently complete remains, I’d always rather see a volumetric estimate. I guess that 30 tons should be more close to the real body mass for this animal. After all, an humerus of 160 cm and a femur of 191 cm long, are not nothing specially big. I also think that the 0.73 g/cm^3 of density for a bunch of birds, should be taken with caution, these SG was taken from death animals and lungs were inflated artificially to its maximum. In a relaxed or normal position, the SG of any bird should be considerably higher. But what does this say about sauropod mass in general? Was Argentinosaurus more massive? Or Puertosaurus? Or “Antarctosaurus” giganteus? Can you deduce something about their mass from your results? What is interesting to me, and confirmatory of both methods, is that they provide overlapping estimates of error. So, mass estimates based on limb robustness come with an explicitly quantified prediction interval, and you can tweak the assumptions of your volumetric models (e.g. density, rib orientations, thickness of tissues around the bones) to arrive at a range of possible masses. It is not clear to me that we can prefer any particular set of assumptions over any other. It does seem that the central tendency of mass estimates provided by limb scaling is higher. You compare it to the lower bounds of your volumetric estimates (59 vs 35 tonnes). But it is also reasonable to compare lower bounds (40 vs 35 tonnes) or central tendencies (59 vs 47.5). These differences are not trivial for those interested in absolute sizes. However, they are a lot smaller than the original comparison implies, especially on a log scale. The difference could be even smaller if I took the lower bound of volumetric estimates as 40 tonnes. I’m pleased to read such a careful discussion of volumetric estimates because ideally we would arrive at the same estimates based on both methods, and clearly there is further work required to achieve that at really big sizes. Happily, my reading of the literature is that the methods agree much better at smaller sizes (less than 10 tonnes). Should we be surprised if they fall out of line at giant size? Perhaps not, in this region limb scaling estimates are extrapolating well outside the sizes represented by extant tetrapods. However, we might hope that limb scaling preserves the rank order of body size well, and provides mass estimates for a larger number of dinosaurs than we could achieve with accurate volumetric models. This is necessary for larger-scale studies of body mass evolution – which is what Nic Campione’s method is intended for. The detailed comparisons and discussions on your blog are very important and helpful in constraining how much faith we can have in dinosaur mass estimates. My take-home is that for many of the features we’d like to see (rank order, log-transformed values, ballpark accuracy), we are probably doing pretty well. But is also seems possible, maybe even likely, that giant dinosaurs had slightly larger safety factors that we’d expect based on scaling of living animals. Thanks for chipping in, Roger. This was mostly Matt’s post, though I did review it before posting. Yes, it’s encouraging that volumetric and allometry-regression estimates are at least consistently in the same ball-park. Traditionally it’s not been true that allometry-based methods have given higher estimates: Russell et al. (1980) used a method of this to yield a frankly pretty ridiculous estimate of 14900 kg for Giraffatitan. But they don’t say much about the details of their method, and no doubt the way it’s being done now is much better. Only if we assume a priori that all the organisms we’re investigating were equally athletic. Gerenuks weigh about 40 kg; so do capybaras. But the latter have much more robust limbs, and would be predicted a correspondingly higher body mass by any method based on allometry regression. […] and provides mass estimates for a larger number of dinosaurs than we could achieve with accurate volumetric models. That at least is unarguable. Regression-based estimates for animals known only from a couple of proximal limb bones are far more useful than whatever lame attempt at a volumetric estimate we might make on that basis! How applicable would Mark Witton’s bone mass methods used for giant pterosaurs be to sauropods? I think it would be well worth trying. There’s no a priori reason to think it would be any less applicable to sauropods than to pterosaurus, and it would be good to add a third completely new approach to mass estimating (as all the other methods I know are variants of some kind or another on volumetric estimation or allometry regression). >”Only if we assume a priori that all the organisms we’re investigating were equally athletic. Gerenuks weigh about 40 kg; so do capybaras. But the latter have much more robust limbs, and would be predicted a correspondingly higher body mass by any method based on allometry regression”. I don’t have any gerenuk measurements. However, Campione’s dataset contains a capybara that weighed 56.5 kg in life (min. humeral shaft circumference = 60.5 mm; min. femoral shaft circumference = 70.5). It also contains an impala, an animal so athletic that they’ve named sports teams after it, with a life weight of 60.5 kg, and very similar circumferences (65 mm; 69 mm). It is true that the capybara has short limbs with a more robust appearance. But it isn’t true that this is misleading to mass estimates based on shaft circumferences. If you wanted to pick an animal that breaks the rules for limb scaling, moles would have been a good option! However, I’d discourage arguments based on anecdotes and isolated examples. I’m not saying that the limb scaling methods are perfect. But we can quantify their errors for living animals, and they do perform well over the range of body sizes represented by extant species. I’m not talking about gerenuks (and moles would indeed have been even better) as evidence that allometry regression “doesn’t work”. I’m making the more fundamental point that what it tells you is different from what you sometimes want to know, and so is useless for certain kinds of work. We can assess athleticism using the strength indicator Z/amgx of Alexander (1989), and compare that value for various dinosaurs. But since Z is related to long-bone measurements, if our value of m is also derived from those measurements, then a value based on the ratio of those two is always going to be the same. We’re comparing apples with apples. « Give a talk that holds attention!